"I've been building bridges and utilizing the engineering of different materials and everyday items for years," said Jeff Kudrick, with J&M Lifestyles. "So when we needed a desk for our office, I wanted something that would make a statement." 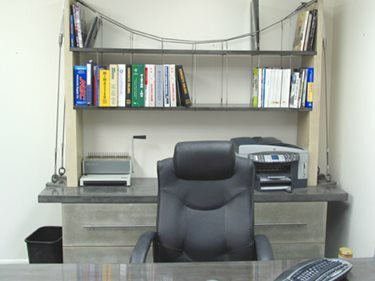 What he ended up with is a concrete desk and file cabinet with shelves designed to mimic a suspension bridge. 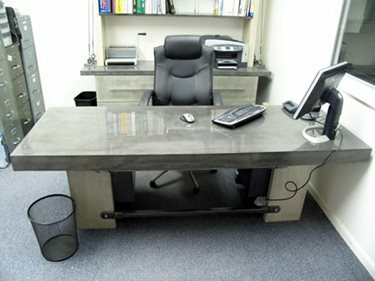 The desk has a cast, lightly reinforced 4-inch-thick concrete top supported by L-shaped concrete brackets. "To add a bit more interest," said Kudrick, "we made ¾-inch thick GFRC (glass fiber reinforced concrete) faces for the drawers and made custom pewter brackets for the drawer pulls." 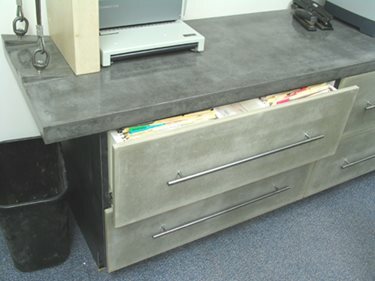 The concrete for the drawer faces was mixed with an integral gray color and the countertops, both for the desktop and the countertop on the filing cabinets, were mixed with black. "We added whiting on the desktop and filing cabinet top to get a smoke effect within the black," he said. The drawers are faced with GFRC panels and have custom-made pewter drawer pulls. The desktop was polished to get a high shine. 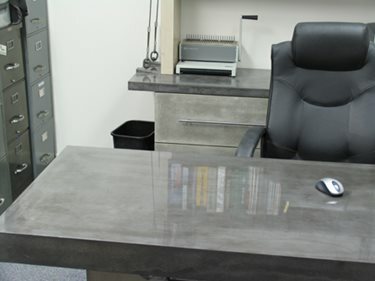 To get the shine he was looking for on the desktop, Kudrick first polished the concrete to an 800 grit then applied an acrylic sealer, which he polished to about 4000 grit. "It's an automotive quality finish. With the fish tanks we make we have to buff out acrylic panels so we use those same systems to buff out some of the sealer surfaces on concrete furniture like this, bringing it up to a high shine." 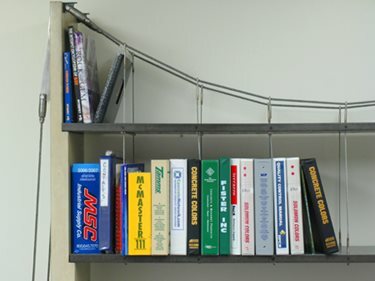 But the most eye-catching feature in this office is the bookshelves, which are small suspension bridges. 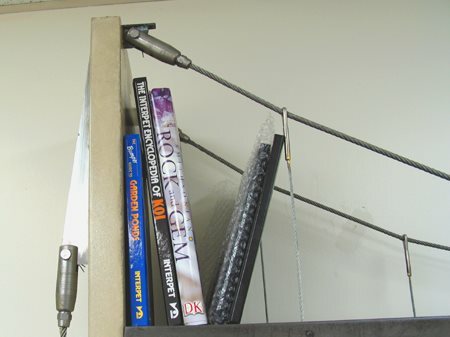 The shelves (Kudrick calls them "road decks") are fiber reinforced concrete supported by stainless steel cables. The cables are supported by vertical concrete stanchions at each end and the stanchions are held in position with cables running down to anchors in the countertop. "The stanchions have a bracket embedded at the top to transfer the vertical forces. The stanchions are not connected to the desktop but there's a rubber pad beneath each. On the desktop we have coupling nuts and eyelets that are welded to the rebar structure in the bottom, like bridge abutments. As you add weight to the shelves, the eyelet is adjusted to take up deflection in the cables. Once it's tight and we level out the decks you could put 4 people up there on the shelves." black color to mimic the appearance of asphalt. Kudrick carefully worked out all of the connectors for the shelving. 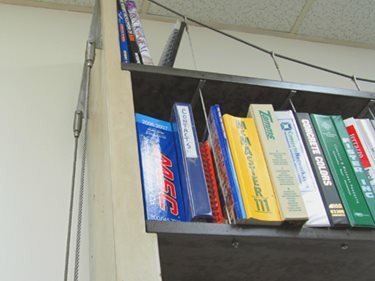 The vertical cables that hang from the main draped cables go through the first road deck where there's a bracket and set screw to connect the shelf to the cable. The cables then continue down to a knurled fitting in the lower shelf. "We kept the shelves black to simulate road decks," said Kudrick. Kudrick approaches his concrete work with a diverse background. "I've done onsite engineering on everything from plumbing and boilers to concrete to precast stadium jobs. We've done sewage treatment plants and poured thousands of yards in a day. One of the things I've worked on for years is rock work with fish tanks because I was always interested in habitat for animals. Today, our primary business is as a design-fabricator with our host medium being concrete. We come up with different ways to use color and abstract design and incorporate water. This desk is only the tip of the iceberg if someone had some ideas and a budget. We can create many different finishes; it's a lot of illusion. Creating things that look like something that they are not or creating mass but taking it to a different level to make people think about how it's done."